Free Attractions normally mean boring attractions. I don't know about you but when I was a kid, my parents dragged me around old houses, churches and other places that they wanted to take me and my brother too. I could never understand why they wanted to take us to these drafty cold buildings, but now as a parent I can understand why. They wanted to save money, but still have a family day out. Can't fault them for that I suppose. But luckily enough for you and your family you don't have to suffer in the same way as I did, as throughout the keys there are some great historical sites, interesting charitable works, and just some really weird off the beaten track stuff, that gives you a real taste of the Florida Keys. And best of all they are are free. So if that is what you want in life you have come to the right place! We have listed the best that we can find by area, with directions, maps, and opening times for each. In fact if you feel you could have done with more information or simply want more free attractions then drop us a email and let us know, and we will add it. The names of the Parkers, Pinders and Russells may not mean much to you at the moment, but they will do after visiting the Pioneer Cemetery in Islamorada. Well the cemetery is the resting place for the founding fathers and mothers of the island of Islamorada. So for anyone who is interested in Florida Keys History we recommend that you stop by and take a look. The FKWBC will leave you inspired but also distressed at how thoughtless mankind can be. All the birds that have been brought in are in a pretty bad way, and the center do a fantastic job bringing them back to full health. You will certainly leave with a firm decision that we can all do much more than we do to protect the environment. Did you know that Key West is the only place in America to never have experienced frost? So I guess you wouldn't then know that it also has its own botanical garden which as Key West has never had frost, nor has the garden. It's the only one of its type in the continental US. This is one of those free attractions which is a true Key West secret. 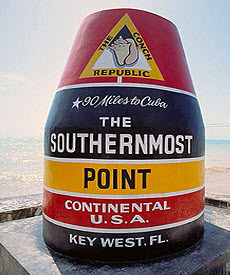 The Southernmost Marker is a big ugly multicoloured buoy that stands at the Southernmost point of USA. And really that is the only reason that people flock to it, to have their photos taken, and boy do they flock. The thing I suppose has become the stand-out iconic image of Key West and due to its rainbow colours matches the bright crazy world that is Key West perfectly. Don't be put off to the fact that this is a cemetery it is so much more than that. In fact it is the dead centre of Key West....dead centre get it? No, actually this is of huge historic importance which is why a tour runs weekly showing the famous graves of the departed that now lay in its grounds. The Key West cemetery is really somewhere for the adults as not many kids will be interested I imagine. The Pelican Path is one of the best things to do once you settle into Key West, as it really helps you get your bearings. Winding around the island, it takes you near over 50 of the most prominent and historic buildings in Key West, all for the grand cost of NOTHING. It was created by the Old Island Restoration Foundation and they have done a really good job. 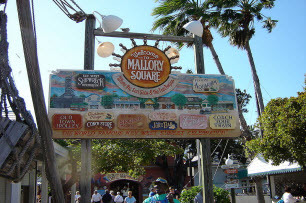 Mallory Square can be found at the north end of Duval Street and every evening as the sun goes down is the home of the sunset Celebration. Street traders, entertainers and people simply out for a good time flock to the area to enjoy the atmosphere and of course the world famous sunset. Because of how the Florida Keys sits between the Gulf of Mexico and the Atlantic Ocean, it is always going to be at risk from the worse that nature can throw at us. So you can be assured that the employees of the National Weather Service, have their hands full providing detailed weather reports for the islands and people who work around the islands. The amazing thing about the Eco Discovery Center is not that it is a free attraction (as you would normally pay good money to get into places like this)but that it is here at all. Costing over $6,000,000 it is hugely expensive and over 6,000 square feet it is also simply huge. Built to teach us all how fragile the Florida Keys eco-system is and how we should do our best to protect it. I remember the first time I saw a Key Deer live and in the flesh. We had just had a lovely day in Big Pine Key, and as I drove back to where we were staying my daughter suddenly spotted one. We slowed down and opened the door of the car, and this little deer stood about two feet away from us. It was magical, and thanks to the Key Deer refuge there will be many other families that hopefully have the same experience for generations to come. The Blue Hole in Big Pine Key can easily be missed if you aren't careful. The disused quarry is now a sanctuary for Florida Keys wildlife, and even two resident gators, who enjoy the peace and quiet that the Blue Hole has in abundance. Take a walk around the nature trails that criss-cross the area, whilst looking out for plants and birds that are listed at the beginning of the walks.